Summary: These figures from the recruitment software developer were never going to be great. The overriding theme of the last three years — greater marketing and product investment — once again hit earnings and will continue to do so throughout 2018. The statement talked of some client-fee reductions, too. Still, at least overall revenue and the hefty cash position have both advanced to new all-time highs. Exactly when a profit revival will occur remains anyone’s guess — but I am hopeful the chief exec/71% shareholder will one day oversee a recovery. I continue to hold. April’s first-half figures had already prepared me for bad news for 2017 and 2018 earnings. However, yesterday’s statement did reveal positive revenue progress — full-year sales gained 16% to a new company record. WOR claimed investment in marketing, product development and customer support had underpinned the top-line improvement. However, the group also admitted such progress came with extra costs — which caused operating profit to drop 42%. WOR’s 2017 profitability was the group’s lowest since 2010. I have to confess, I did not anticipate profit falling so far three years ago. But look at the lowly H2 profit. April’s interims did warn of the company operating at a loss during the early H2 months. I should add that the annual dividend has been maintained at 3.5p per share for the twelfth year. I note the term “known reductions in revenue from the existing client base”. I bet that concerns HMRC, which is WOR’s largest customer and represents about 12% of group revenue. My investigation back in 2015 revealed that HMRC’s standard monthly payment to WOR had dropped by a massive 66%. The HMRC contract is up for renewal in early 2018 and I dare say WOR has again pitched a lower fee to keep the business. The monthly spreadsheets HMRC publishes should tell me whether WOR’s fees have been hit before the next results in May. At least my rough sums suggest HMRC paid WOR 5% more during 2017 than 2016. Given the profit setbacks during 2015 and 2017 — and the one due for 2018 — it’s easy to understand why WOR has kept its dividend low and cash pile high. The year-end cash position came to £11.6m, or 153p per share, and is equivalent to two-thirds of the market cap. The balance sheet carries no debt and no pension obligations. The favourable working-capital movement was probably due to customers paying upfront to use WOR’s software. The annual report will provide details of such ‘deferred income’, which in turn can perhaps indicate the level of potential revenue for 2018. I am also pleased WOR’s expenditure on tangible assets remains modest and that the business continues to write off all development spend as incurred. With second-half earnings at a very depressed level and no sign of any improvement until 2019 at the earliest, gauging WOR’s valuation is not straightforward. The only real yardstick is the £11.6m cash position, which adjusting for upfront customer payments is probably about £10m. With the market cap at £18m, the underlying business could arguably be valued at £8m. Set against the £772k operating profit just reported, that £8m valuation does not appear to be an obvious bargain. The hope is, of course, that WOR’s investment in marketing and so on pays off, and that revenue continues to advance and profitability in time rebounds to previous heights. My earlier WOR write-ups consistently hoped for a profit revival — I had been expecting 2014’s peak 25p per share earnings to return by 2020 — but that projection presently looks hopelessly optimistic. I reckon it could now be 2022 before WOR recovers back to margins of 20%-plus and an annual profit beyond £2m. First point I notice is that the report’s cover picture makes its seventh consecutive appearance. 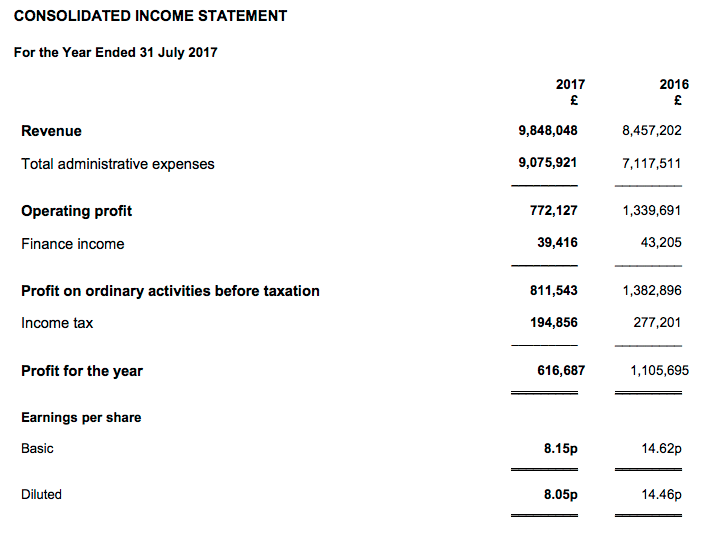 UK revenue gained 12.6% or £754k, of which HMRC — WOR’s largest client — contributed an extra £261k. Without HMRC, UK revenue gained £493k or 10%. My own guesswork from monitoring HRMC suggested the department paid WOR £872k during 2017, up 5% on the (supposed) £828k for 2016. Clearly my estimate was way below the £1,321k/24% actually achieved. I will have to take a closer look at the monthly updates that HMRC issues. These updates document monthly payments to suppliers that are greater than £25k, so perhaps some payments to WOR were not included. 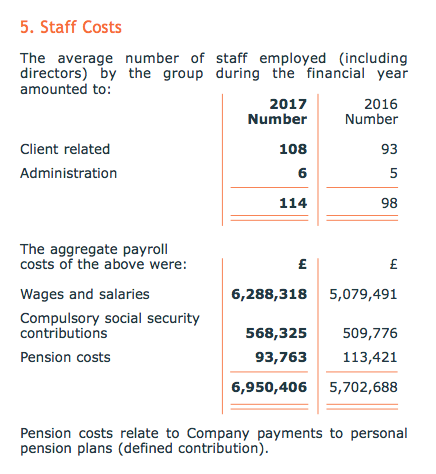 The HMRC updates changed their VAT presentation during the year, but even so, the discrepancies here are wide. I am now beginning to wonder whether the HMRC updates are that reliable. I guessed this time last year that US revenue could be £2,846k following the post-Brexit weaker GBP. As it turns out, US revenue came in at £2,983k. The GBP:USD exchange rate averaged 1.47 for the 2016 financial year and averaged 1.27 for the 2017 financial year. As such, 2016 US revenue of £2,417k should have translated into 2017 revenue £2,797k purely on currency movements alone. So… £2,983k less £2,797k gives extra underlying US 2017 revenue of £186k — up 8% on 2016’s £2,417k. As I noted in the Blog post above, WOR enjoyed favourable working-capital movements during 2017. Trade receivables represent 12% of revenue for 2017, which compares to 25% last year and between 15% and 32% since 2009. So 12% seems to be a freak result, and I dare say could prove to be a low point. Deferred income increasing by £162k is encouraging given the hesitant management commentary about second-half trading during 2017 and the outlook for 2018. The advance suggests there could be more revenue in the pipeline than this time last year. The chief exec — and 71% shareholder — continues to enjoy a fair whack for running a business that currently makes a sub-£1m operating profit (at its 2014 peak, WOR earned only a £2.4m operating profit). Some 71% of revenue now goes to paying staff — before 2015, the proportion was generally less than 60%. At least the 16 new recruits of 2017 earned their keep — revenue per head stayed at £86k. I groaned last year about WOR’s boss purchasing the group’s HQ. £95k does not appear to be an outrageous sum. I continue to monitor the monthly expenditure updates from HMRC, WOR’s largest customer, albeit with the proviso from the Blog post above (“I am now beginning to wonder whether the HMRC updates are that reliable“). These datasets show WOR receiving its usual £46,680 monthly system support payment (£56,016 inc VAT) for work done during September and October 2017. However, the November dataset showed WOR was paid an extra £24,850 (£29,820 inc VAT) for “Quarterly Sift Tools Test Fees” for Oct/Nov/Dec 2017. So, on an accrued basis, total HMRC revenue for the current financial year (to 31 July 2018) received to date is £164,890 (ex-VAT). Also, HMRC’s base payment run-rate to WOR (ex-VAT) appears to be 12*£46,680 + 4*£24,850 = £659,560. For what it is worth, a £659k run-rate compares to my £873k HMRC calculation for the year to July 2017. That period was bolstered by HMRC paying WOR £200k-plus for the aforementioned Sift Tools product. This dataset shows WOR receiving its usual £46,680 monthly system support payment (£56,016 inc VAT) for work done during November 2017. On an accrued basis, total HMRC revenue for the current financial year (to 31 July 2018) received to date is £211,570 (ex-VAT). I continue to monitor the monthly expenditure updates from HMRC, WOR’s largest customer. Oh dear — no reference to WOR this month. This has happened before — my records show August 2017 and June 2015 were the last times HMRC did not pay WOR during the month. I can only trust HMRC’s next update will show payments to WOR for work done during both December and January. No reference to WOR again this month. Two consecutive months without payment has never happened before — and feels ominous. Here is WOR’s contract with HMRC. Oh dear — the contract runs to 31 January 2018. Has the contract not been renewed? I will have to investigate further. 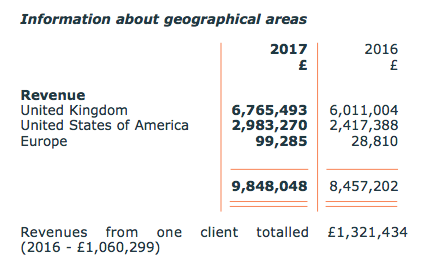 HMRC generated revenue of £1,321k (c14%) during 2017, and would be a substantial client loss.